The VIM Tools HBR5 Bit Ratchet is one of my all time favorite tools and that made the VIM Tools HBR3 just a little too tempting to try. I bought one last month and have been using it since. 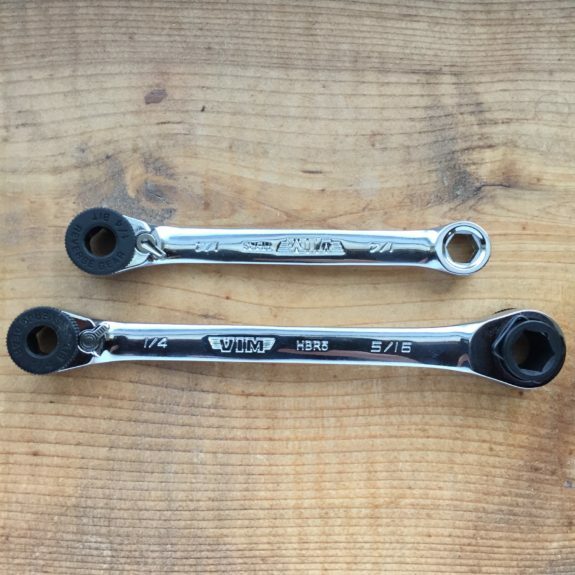 At first glance, the HBR3 and HBR5 are very similar tools but there are some differences. The HBR3 is about 3.5″ long which is about 1″ shorter than the HBR5. It is smaller in almost every dimension which makes it considerably more compact and lightweight. 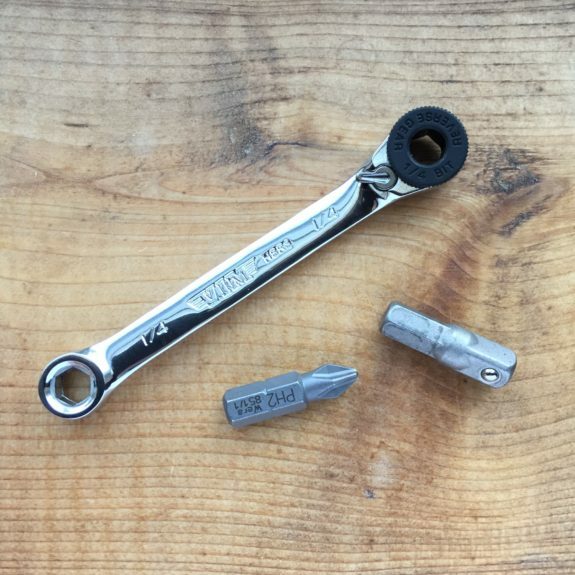 The HBR5 features a ratchet at each end (see the HBR5 review for more details) but the HBR3 has a ratchet end and a box end both of which accept standard 1/4″ shank bits. The smaller size and the box end is what really sets the HBR3 apart from the HBR5. The compact size and excellent quality is what has endeared the HBR5 to me. The HBR3 is even more compact and just as well made. The HBR3’s box end has proven to be very handy. It is extremely compact, barely adding any length to the bit itself, which allows it to get into very tight spaces – like behind a door knob to tighten the screws holding it to a door. It also allows you to apply a lot of torque without fear of breaking your ratcheting mechanism. The ratcheting end has a quick disk/speed wheel that makes it easy to start fasteners even when they don’t have enough friction to start using the ratcheting mechanism. It is reversible and has a small lever to change directions. VIM Tools claims that their ratcheting heads are the smallest in the industry and I believe it having used several competing tools. The HBR3 seems to be intended to use as a bit driver predominantly. It does not come with provisions to be used with sockets but the adapters to accomplish this are easy to find. I recommend picking one up as I find it to be very handy. This is a great socket wrench for tight spaces. I also recommend adding a bit extension if you plan on using this in your range bag so that you can access things like AR-15 grip screws.